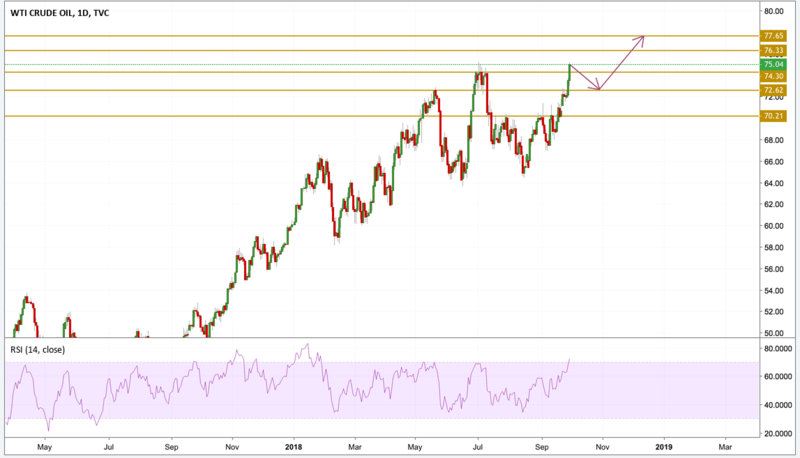 As oil supplies are about to come under pressure in the coming months, the crude oil market seems to be prolonging its state of instability and uncertainty. The OPEC / non-OPEC meeting in Algiers in late September provided an unclear outcome. The future of oil prices will depend on how supply is going to meet future demand as US sanctions on Iran are set to take place in the next couple of months. So let's examine recent facts: Saudi Arabia, OPEC’s leading oil producer, and Russia have largely criticized US President Trump's request to increase oil production to counter higher oil prices that will slow down the US’ economic growth. Trump has already threatened to take action if the oil cartel continues to squeeze the market to gain higher revenues. However, the meeting in Algiers produced a different opinion and the answer was not that clear: no increase in production unless market conditions indicate an extreme state of tightening. OPEC alongside Russia were very straight-forward and bold with their statement as they stood by the principle that no external opinion will be taken into consideration, they said that they will be the decision makers and it's up to them when and how to act. Analysts are keeping a close eye on the situation where a shortage in supply could hit the market gradually in the near future especially after November this year, when US sanctions will be fully implemented on Iran and all of its customers. But OPEC have repeatedly stated that oil stockpiles are still above their five-year average and, if needed, an increase in oil production is always an option. What traders are saying ? Traders such as Mercuria and Trafigura have already warned about prices spiking around $100 a barrel. Obviously, oil traders seem not to have reached a consensus as disruptions could emerge anytime. On the other hand, the escalating trade war between the US and China could lead to lower demand, hence dampen the bullish sentiment in the market and stabilize prices as a result. What could trigger the next oil price move? Recently, producers such as Iraq, Libya and Russia, have published very positive preliminary production volumes, but no real volumes have been reported on the market. If we go back a little bit in history, we can notice that production figures always showed up around OPEC’s meetings. From a technical point of view though, the price is back to retest the highs printed in July at $75.24 per barrel. The latest rally does seem over-stretched with Crude oil entering an overbought state as we can see on the RSI chart. Based on that, we can say that the price has a little bit more room to stretch further to the upside before entering a consolidation zone and retest near support level (around the $73 level). From there though, a fresh leg higher would be expected and the next level to watch will be the $77.65 mark.